In just five years, Independent Bookstore Day has become a springtime book-buying holiday, increasing book sales on a national level. In 2018, participating stores saw an average increase in sales of 200% on Independent Bookstore Day (the last Saturday in April). “Bucket List” inspiration kits for various interests, free to shoppers from 10:00 (while supplies last; quantities are limited). Complimentary coffee, bottled water, and juice boxes. Local authors Dan Peeler and Charlie Rose bring their book series to Interabang with extra attractions to delight younger readers: a performing Dragon marionette, paper sack puppets, and a folding/taping Dragon craft. They will also read and sign their Dragon books, which are aimed at readers of varying ages. 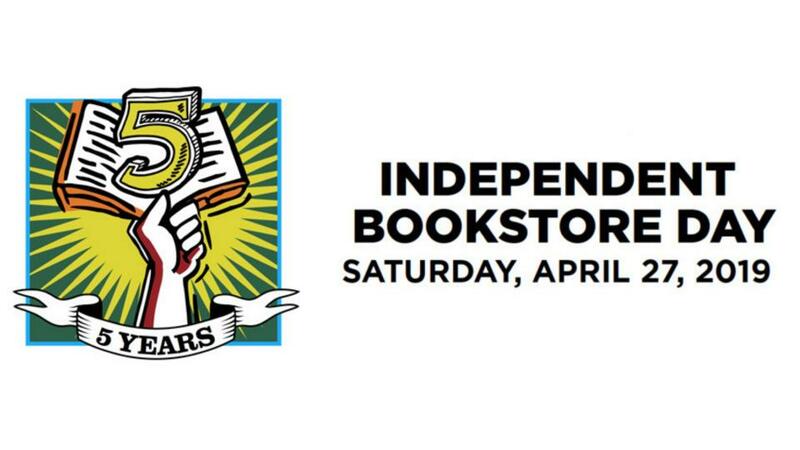 Exclusive “day of” merchandise created for Independent Bookstore Day by publishers and authors. These will be introduced and available only at participating bookstores: not before, not online, not “reserved,” and not in chain stores. Our supply of these limited-edition items (which depends on order fulfillment by the distributor) will be offered strictly first-come, first-served. These local entertainers believe in more than just “activities.” Their passion is to make people laugh, smile, and have unforgettable memories. We are happy that their return visit to the bookstore comes on this special day. Cheers to books! We’ll serve complimentary beer, wine, and soft drinks as you browse the store. Raise a glass to Independent Bookstore Day and keep talking to our booksellers about your favorites and theirs. About Interabang Books: Interabang Books takes its name from the symbol that combines a question mark (an interrogative) and an exclamation point (a bang, in typesetting lingo). In suggesting the search for knowledge and the excitement of discovery, this punctuation mark conveys the spirit of our independent bookstore – and the sort of experience we want readers to have with their selections from Interabang Books. Opening day at Interabang Books was July 1, 2017.